The Dyckman Houses in uptown Manhattan, an example of middle-class, affordable, public housing built. The all-important topics of real estate power and affordable housing in New York City have spawned a thousand academic treatises and nonprofit reports but not many readable explainers for the lay public. Housing is a messy, complicated topic that features a quadrennial showdown in which policy buffs throw around acronyms like confetti. Enter artist and affordable housing activist Amy DeHuff. Most New Yorkers are too busy making ends meet to research housing policy, let alone to read Housing New York, Mayor de Blasio’s 116 page ten-year plan released last May. De Blasio’s plan to build 80,000 and preserve 120,000 affordable rental units is a darn near impossible read for the average citizen, primarily because housing policy is really complicated stuff. The policies that create and finance affordable housing pass through three levels of government before a brick even touches mortar. Recent articles from Slate and the NY Times have begun to deconstruct this complex topic for us. In this series we’ll explain NYC’s policies and crowd source experts from all corners of government to weigh in on a simple question: How can NYC increase the percentage of affordable rental apartments in its housing stock? Housing New York, Mayor de Blasio’s 116-page ten-year affordable housing agenda has been called the most ambitious in NYC’s history. One year in, his administration is on target to meet its goals. In his recent State of the City Address, de Blasio even pledged to end homelessness amongst veterans, produce an additional 160,000 market rate units and 1,500 units of affordable housing for artists, and provide free legal services to protect tenants from landlords in neighborhoods undergoing rezoning. But the media and local communities are still up in arms about de Blasio’s strategies. In 2012, 54% of NYC’s renter households spent more than 30% of their pre-taxed income on rent, classifying them as “rent burdened” by the federal government. Between 2000 and 2012 apartment rents rose by 75%, compared to 44% in the rest of the country, while renters’ wages remained relatively stagnant, increasing only 15% after adjustments for inflation. In 2011 there were about one million extremely low-income and very low-income households in the city, but only 425,000 rental units affordable to them. Between 2002 and 2012, NYC lost about 88,000 rent stabilized Over the next 10 years, NYC risks losing another 58,288 affordable units as government contracts with owners providing affordable housing will end. This doesn’t include countless owners who convert regular apartments to luxury rentals through renovations and rent hikes. NYC’s homeless population has reached record size with approximately 60,000 people sleeping in shelters every night, including 25,000 children. The national context in which de Blasio finds himself is also stark. In an optimistic post-recession policy manifesto called “The Metropolitan Revolution”, experts confirm that, mired down by partisan politics, the federal and state governments aren’t coming to the rescue. The difference between 20th and 21st century policy is that now cities are on their own. The silver lining, they say, is that cities can bring about change more holistically than in the traditionally compartmentalized government approach. A creative approach is needed. In such a challenging market at such a politically challenging time, de Blasio is making great strides by increasing fair housing and legal resources for tenants and steadily tweaking programs to favor tenants and eliminate unnecessary subsidies. But to the public, his administration is applying some conventional 21st century housing policy strategies that seem inappropriate for NYC’s unique market. The meat and potatoes of de Blasio’s plan to build 80,000 and preserve 120,000 affordable rental units reflects a current policy strategy whereby government leverages the capital, manpower, and growth of the private market to build and maintain affordable housing. The theory is that, if the free market economy is buzzing along, then private developers can be convinced to throw a few affordable units into their market rate (unsubsidized) rental buildings if they’re promised tax breaks and exemptions, or an increase in square footage. In turn, the government avoids the costs and responsibility of developing, managing, and maintaining apartments. Cities with weaker housing markets may need incentives to entice development where investments are riskier and any new development boosts property values. But NYC’s housing market is saturated with development competition. In the first three quarters of 2014, the price of land in East New York nearly tripled. There are dozens of federal and local tax break programs in NYC for developers who create affordable housing. On average, most of these programs require the developer to make only 20% of their units affordable, and de Blasio is trying to increase the requirements to 30% in some cases. But a 20% requirement requires creating 4 market rate units for every affordable unit. For example, that’s 320,000 market rate units that could accompany the 80,000 affordable units that de Blasio hopes to build. One issue with this federal policy model in NYC is that developers using these incentives aren’t even creating “market rate developments” but instead are building luxury rentals and condos in order to break even after extremely high land acquisition and construction costs, they say. The administration is making tweaks to ensure that subsidies offered are absolutely essential, but the model is here to stay. It’s still hard for the public to understand why NYC is passing up future tax revenue by providing tax breaks to some of the highest corporate rollers and its even harder to understand why we are relying on a strategy that requires the creation of so many market rate (luxury and condo) units, to generate so few affordable units. Communities now associate a new affordable housing development, with gentrification. Like most of his predecessors, de Blasio is also striving to build housing for NYC’s growing population, expected to reach 9 million by 2030. Developers and lobbyists assert that government needs their assistance to reach this goal, which will go unmet if subsidies are reduced any further. De Blasio recently announced the addition of 160,000 market rate units to his ten-year plan list of goals, which, theoretically, should be effortless with incentive programs. But if “market rate” now means condo and luxury units, these are not the kind of market rate units that seem essential for future populations. Perhaps the question is, what kind of future population? Next time we’ll take a look at another point of contention, which is what these programs even mean by affordable. For now, let’s see if our experts have ideas for how incentive programs could be tweaked to create more affordable housing or to create the kind favored by communities. The first comment will come from Janos Marton, who will expeditiously summarize the golden age of New York City’s commitment to building public housing. New York has always had a shortage of quality, non-dilapidated housing. For a long time, the obvious solution was to flee northwards in Manhattan, or escape to another borough. But housing eventually became overcrowded there too. During the 1930s and 1940s, New York City felt the first effects of suburbanization thanks to an elaborate system of highways, bridges and tunnels built by Robert Moses and the new federal mortgage interest tax deduction, but these policies largely affected the upper-middle class. Back in the City, Mayor LaGuardia used federal money for tearing down slums and rebuilding housing in places like the Lower East Side. But New York City remained packed. During World War II, the federal government had capped rents in over two million apartments due to the severe housing shortage, and in 1950, New York State took over the program. (Rent control is a huge topic, and it merits its own article). While rent control provided protection for renters during the housing crunch, it did not alleviate housing crunch, which was exacerbated by thousands of veterans returning home from the war, and uninterested in living at home with mom and dad. During the late 1940s, Mayor William O’Dwyer initiated a program that used city funds to create non-subsidy, middle-class housing, often on vacant lots. 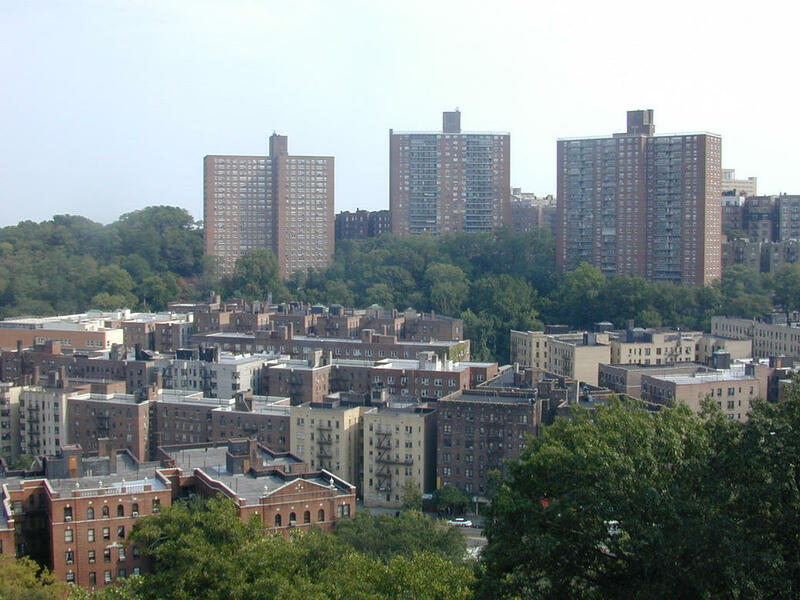 More than 20,000 units were built through this program, including the Dyckman Houses, where Kareem Abdul-Jabbar grew up. Meanwhile, Robert Moses appropriated federal “Title I” funds for “slum clearance” projects that erected mixed income housing developments in previously run-down neighborhoods. The United Housing Foundation, sometimes in partnership with Moses, developed co-ops in the Lower East Side and other parts of town, creating more middle-class housing, often with union support. Another 105,000 units were built under the State’s Mitchell-Lama program. In 1965, the City’s vacancy rate was 3.2%, crazy low, but still 50% higher than it is today. Between 1946 and 1970, the public and private sector collaborated to build 785,000 units of housing- that’s built, not today’s preferred measuring stick of “built and preserved.” In the 1970s the City went into a tailspin, leading policymakers to create incentive programs like 421-A, which Amy and the commenters discuss. There are many reasons this type of public-private housing boom would be impossible to replicate today: The government has less money. Policymakers in most places outside of New York City have labeled public housing a failed experiment. Land is more expensive to build on. There is no Robert Moses on the horizon. Unions have been decimated. Hence the more creative solutions that Amy and others will explore on these pages. The following comment is from the Brooklyn Brewer, an expert on New York City housing programs. You are right to point out that housing policy in a big city like New York is complicated. The average person doesn’t spend all day thinking about these issues, and probably draws conclusions from the firsthand experiences of his/her own circle of acquaintances–which, in a city of nearly 8.5 million, is a pretty small sample. To offer a bit of counterpoint to the suggestion in the article’s first sub-heading: at least this mayor is not confronting an economic crisis that freezes new construction for a period of a couple years. I’m not sure I would categorize the city’s current efforts as 21st-Century policy. Rather, it seems like 40-year old square pegs being plugged into new round holes. One might say that given enough funds, the housing crisis–not to mention homelessness–would be solved. But it isn’t so simple; too many New Yorkers struggle to defend the “character” of their neighborhoods against incoming development, which is to say, greater density. The famed Koch plan, which de Blasio invokes as inspiration, was a success because it understood the needs of the neighborhoods the city had failed for decades. The solutions and government programs of that era do not fit the problems the city faces today–a fact the government and housing industry alike must acknowledge. But it can be done. The following is comment is from Scoot, an expert on federal housing programs. First, a point of clarification: most federal programs don’t work like 421-a. There are Low Income Housing Tax Credits, which are essentially affordable housing subsidies provided by the Department of the Treasury in the form of 4 and 9% federal tax credits that developers sell off to pay for the construction or rehabilitation of affordable units. There are also different types of Housing Choice Vouchers that allow tenants to receive subsidized rents. Voucher allotments have been cut recently due to sequestration and have not increased with demand for affordable housing in a long time. However, neither of these programs are tied to market rate development. The 421-a credit and recently proposed mandatory inclusionary zoning are both incentive-based programs that seek to produce new affordable units. These are decidedly local in character and are based on the perceived appetites of local developers. To say that they’re based on a federal model is inaccurate. That having been said, I would contend that housing policy really isn’t that complicated, at least when we focus on the basic tools that government has to create and maintain affordable housing. Not surprisingly, it comes down to a simple situation of supply and demand: the city is growing and becoming more affluent and, as a consequence, prices are going up because demand formerly confined to parts of Manhattan and Brooklyn- the areas targeted by the old 421-a program- is now boundless, spilling over into all areas of the city (and really, what area isn’t primed for gentrification at this point if East New York is now being targeted by speculators). As innovative as Katz believes cities can be, they’re really stuck with three options: 1) acquire land and build affordable housing themselves to meet demand; 2) introduce tenant protections like rent control that shelter existing tenants from rising prices but leave newcomers (including the children of rent-protected tenants) in the cold; or 3) sell public goods such as development rights to incentivize private developers to build affordable housing. All of these involve a cost to the public, whether that cost manifests itself in the form of higher taxes to fund new development, reduced inventory due to rent control, or increasing density and the proliferation of luxury buildings resulting from the city’s exchange of development rights for affordable housing. While some may object to Deblasio’s methods, people need to understand that every solution has its downside. I don’t believe aesthetics should take priority in this discussion, but I’m convinced that they have a lot to do with New Yorkers’ fear of change. At the risk of offending planner, I must ask, “What would 400,000 units of housing in New York actually look like?” To make things as concrete as possible, it’s the equivalent of over 200 London Terraces (the famous full NYC block apartment complex built in 1930, 17 to 19 stories) or over 25 times the number of units in Coop City. Where will all that square footage go, and will it be built in giant towers sprouting from lower neighborhood through air rights transfer? Or on remaining redeveloped waterfront sites?